When temperatures go below freezing, perhaps the last place you’d want to place your lips is anything made of metal. Anyone who’s ever played in a marching or military band for an outdoor performance knows that the show must go on, regardless of Mother Nature’s moods. That’s just what some members of the U.S. 7th Fleet Band did this past weekend, enduring snow and icy conditions to entertain the crowd in Sapporo, Japan. The northern Japan city on Hokkaido island, which hosted the 1972 Winter Olympics, is famous for its annual Sapporo Snow Festival attended by some 2 million visitors who don wool caps and thick layers of clothing to enjoy the region’s wintry landscape and an impressive array of sculptures and statues. The festival runs through Feb. 12. 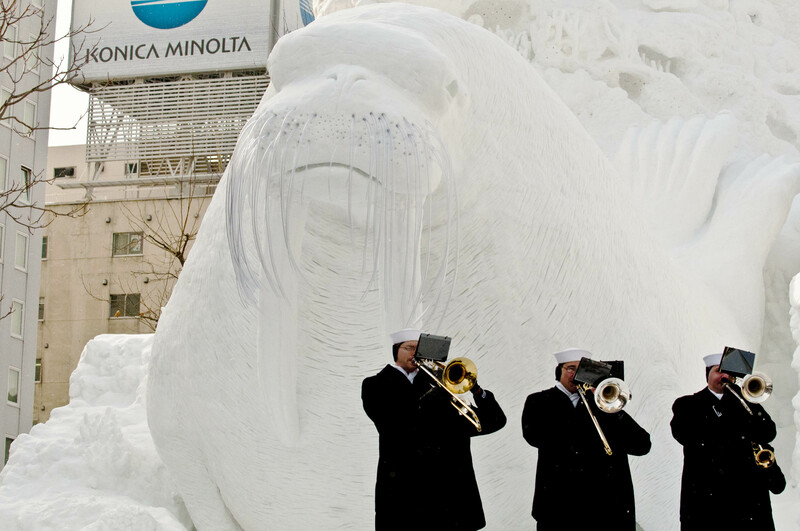 The 7th Fleet band played tunes on stage Feb. 6 as part of the kickoff for the 63rd annual festival, performing for the crowd in front of a massive sculpture featuring some of the ocean’s most popular residents, including a walrus, gray whale, bottlenose dolphin and sea turtle. Meanwhile, sailors aboard fleet command ship Blue Ridge visited the nearby port city of Tomokodai and joined in that city’s annual ice festival. 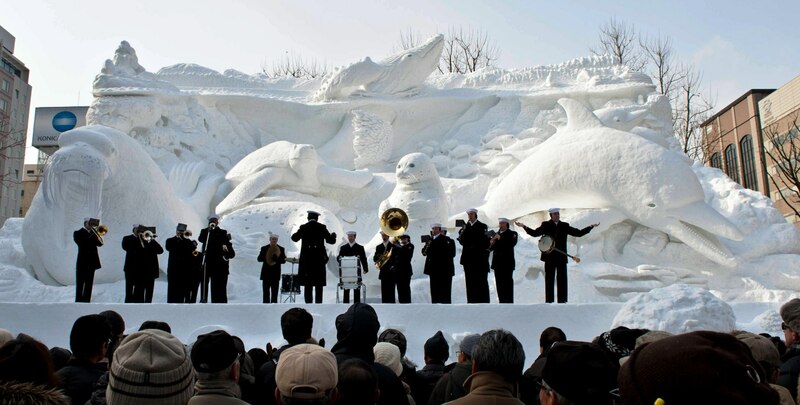 A massive sculpture of sea life serves as the backdrop for the 7th Fleet Band's performance in Sapporo, Japan. And not to be outdone, this year a team of sailors from Misawa Naval Air Facility in Japan battled the cold over three days to shape their own homage to sea service. 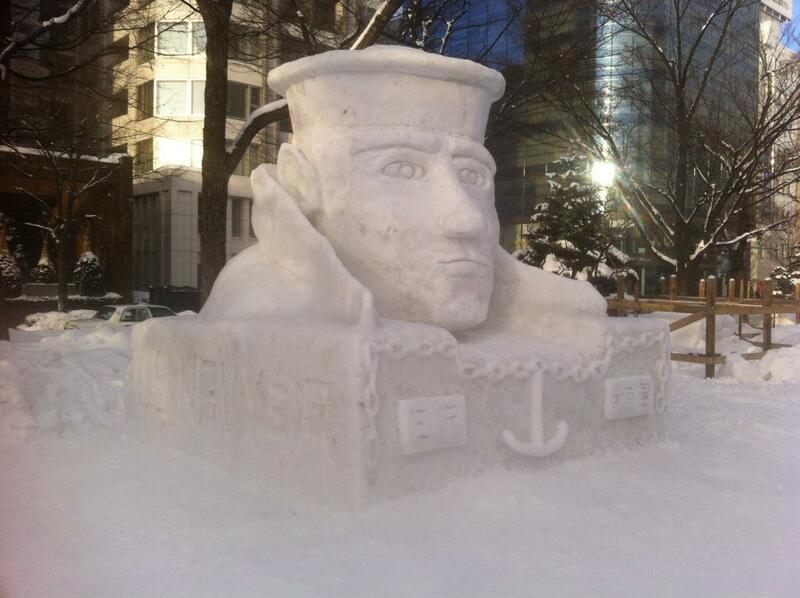 The result is a sharp looking sculpture (below) that honors the Navy’s “Lone Sailor” statue. And after several days making something out of a chunky block of icy snow, the end result is, according to the Misawa folks, “finally is within U.S. Navy body fat standards.” You can see more pictures of other sculptures here. My favorite sculpture is a toss up between the pagoda and the Taj Mahal. The “Lone Sailor” was by and far the most American 🙂 Looked like a lot of fun.